I was reading about cybernetics and stumbled across this article featuring control of an artificial hand through the median nerve. There seems to be relatively little information around this, I would assume it is because of its invasive nature. Anyways, I was curious what you all thought of this and similar technologies. One thing I found especially interesting was the way the body seemed to integrate the microelectrode array, as well as the eventual failure that was caused from overwear of the wires. That's Kevin Warwick he was a professor studying cybernetics and the implant you are talking about was done in 2002 it was cool although it had long term problems such as glial scarring the implant he used was a utah array many of us have dreams of improving upon this implant and are working towards our own versions of nervous interface systems. The whole thing is pretty cool and you can get decent electronics to get the job done (read as in you can fit it into something implantable without selling your kidney). You can even get the electrode arrays required (you may need to sell your kidney for this one tho). 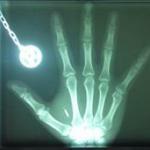 The real problem is the implant procedure. You pretty much need a neurosurgeon + team + operating theater. Basically you need the full treatment and a place/team willing to implant diy stuff. I mean, you can get neural-interface chips with like 8 or 16 channels for i dunno, 20 bucks last time i checked (i still have free samples i once requested). But the surgery is out of reach for me.